What about BICEP2? Does the new Planck result say anything about it? Thanks! A new systematic has been identified for SNe Ia (Rigault+13, and its impact on H0 is indeed to reduce the tension between CMB and SNe Ia estimates. Nothing about primordial B-modes in the BICEP window yet, but it should appear soon. What about the topology of the universe? From this quote :" The future release of Planck polarization data will allow us to improve considerably the constraints on models whose size L [of the fundamental domain] is smaller than DLSS [diameter of the last scattering surface] ...(http://arxiv.org/abs/1311.3509)" one could have expected new piece of information on this (less topical) issue. Only the first assumption was verified by LEP, so there were plenty of room for N_eff to be different from 3.046. I completely agree, maybe except that "Reheating happened above ~4 MeV" is independently confirmed by nucleosynthesis. I didn't mean that Neff is not useful, on the contrary. 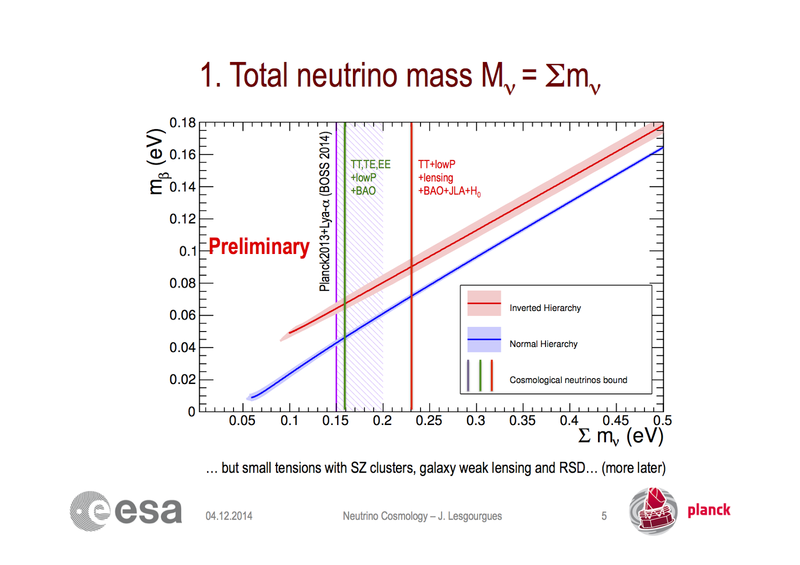 I meant that it is often presented as a measurement of the number of neutrinos, which may be misleading. There are lots of direct distance measurements (not just SN) that favor H0 in the low to mid 70s. These are not so easy to reconcile with 67. I have feared for some time that confirmation bias would drive us to find systematics that reconcile traditional results with CMB fits. Now that we "know" the "right" answer, sure enough, we're finding such systematics. "Planck continues to deliver disappointing results". Disappointing would be if the instruments did not work as expected, or the resolution was less than that expected! I wonder did you mean"some theorists may be disappointed by the empirical results offered by PLANCK so far" ? 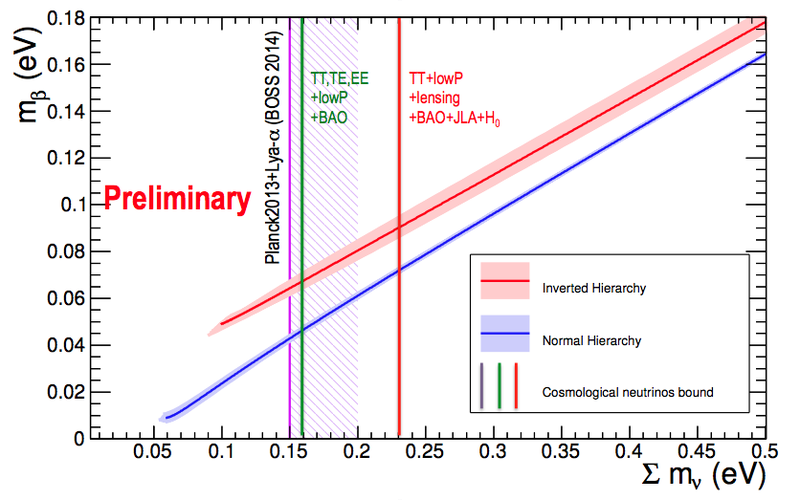 does this imply that the possibility of eV scale sterile neutrinos is now gone in a model independent way? That the Rigault (13) effect hasn't been confirmed by other studies (Betoule 14), both in terms of not seeing the effect (at modest significance) and it seeming to be rather unimportant for the cosmological parameters (although H_0 wasn't studied; however Rigault 13 claimed a much larger effect for the other variables as well). So further study is needed to see if that really helps. 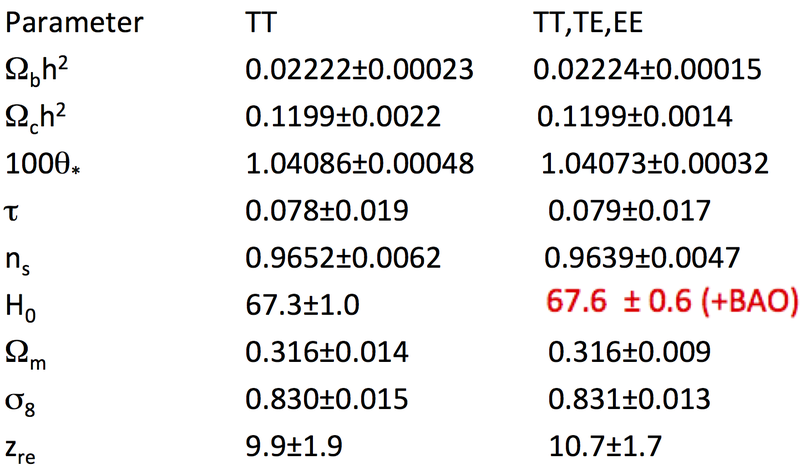 Just a follow-up on the aforementioned impact of the SN Ia star formation bias on the Hubble constant measurement: Rigault+14.